The Roland RSP-550 is equipped with a wide variety of high-quality effects which are suited to a great range of applications; whether it be for line signal processing or for enhancing musical instrument sounds. Moreover, by using MIDI to connect the unit with external devices, a great number of other performance possibilities can be enjoyed. The Roland RSP-550 provides true stereo performance, thanks to its 2-ln, 2-0ut system. Moreover, it allows you to obtain stereo processing even when using mono input, such as when using the SendlReturns on a mixer. 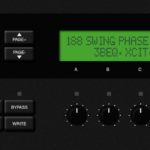 The Roland RSP-550 contains a complete range of Algorithms, each providing immediately usable and practical combinations of the on-board effects. All 39 were carefully designed to accommodate a particular musical situation. Algorithms include Stereo Reverb, Multi-tap Delay, and Keyboard Multi. These Algorithms also contribute towards greater convenience and ease whenever you wish to create your own Effects Programs, since a rich variety of sound possibilities can be obtained simply by changing the parameters of an Algorithm. In addition to the 39 Preset Effects Programs, you can also store up to 160 Effects Programs of your own. These programs can be selected instantaneously, simply by pressing panel buttons or depressing an external pedal. Simply by manipulating controls of by depressing a pedal, or an external MIDI device during performance, you can alter selected parameter values, or select a desired Effects Program whenever you wish. A convenient Program Change Mapping function allows you to match MIDI Program Change Numbers with the Program Numbers of the Roland RSP-550.